As an East Indian conservative, it amuses me when “tolerant” liberals use alleged “white trash” stereotypes to disparage anyone who dares step off their plantation. Yet they keep doing it over and over again. Rather than issue a single legitimate argument for why we should import Syrian refugees into the United States, this typical-liberal jerkwad resorted to ad-hominem attacks rooted in blatant racism. 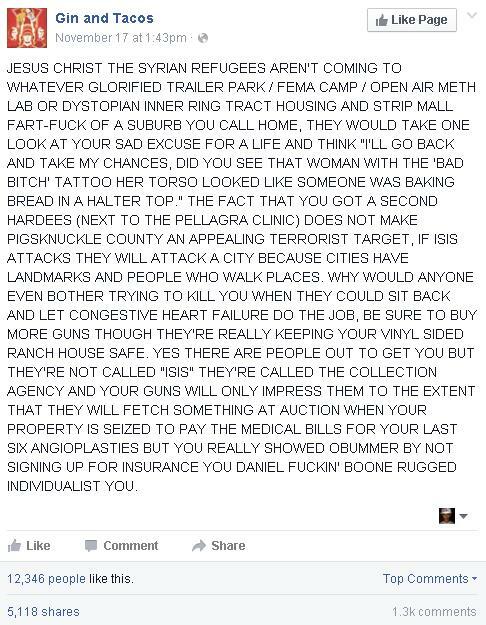 As someone who opposes President Barack Obama’s refugee resettlement plan for a number of valid reasons (here, here,here, here), I guess that I too must be a “Daniel F*****’ Boone rugged individualist” who lives in a “glorified trailer park,” consumes meth and loves guns. Funny, especially given that, as a high-functioning autistic man, I avoid guns at all costs because I know for a fact that I lack the mental makeup needed to wield and/or own one responsibly. Plus, I live in a nice condominium and avoid all illegal substances with a passion. This lunatic liberal’s rant is also amusing because, according to a new Washington Post and ABC News poll, a 54-percent plurality of Americans also oppose Obama’s refugee resettlement plan. I guess this means that at least 171 million Americans are nothing but a bunch of Hardees-eating jive turkeys. And liberals honest-to-God wonder why so many Americans view them as condescending, elitist pricks? Gee, I wonder why!